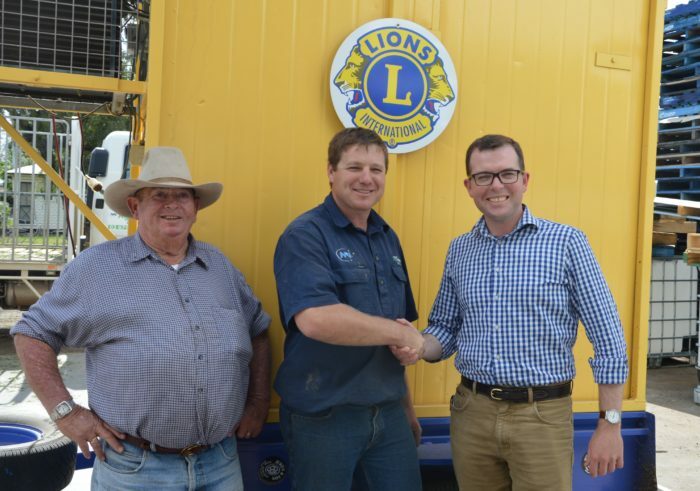 Moree Lions Club members Kevin Johns, left, and Jock King are congratulated by Northern Tablelands MP Adam Marshall on securing a $9,800 grant from the NSW Government. MOREE Lions Club will use a $9,800 State Government grant to teach young kids how to throw a line in local rivers and hook fish, according to Northern Tablelands MP Adam Marshall. The Lions for Lines project will see some fun family days scheduled over the next few months where kids under the age of 12 can get some safe but expert fishing tips. Mr Marshall was in Moree this week to announce a significant investment in new recreational fishing projects for the local region. “Moree is a great fishing town and has some excellent fishing spots and the local Lions are taking the lead in a program to give young local kids the chance to learn how to fish, or fish better, and have a great day out where they can compete for the biggest catch,” Mr Marshall said. “Recreational fishing is an integral part of our local lifestyle with a large percentage of our residents participating in fishing each year, making it one of our most popular outdoor recreational activities. Moree Lions Club vice president and team leader Jock King, who describes himself as more of a fisherman than a catcher-man, said they were looking to hook a fair few local children, aged to 12 years, to the fish days, with their families. Mr King said the club would meet later this week to finalise details now they’d been notified of the grant funds but they’d already had preliminary discussions for support from local fishing clubs. “At this stage, we are considering two fishing spots for the fishing days; one at Mary Brand Park on the Mehi River and another at Gum Flat Reserve on the Gwydir,” Mr King said. The grant will allow them to run the days free-of-charge and also provide prizes from the weigh-ins, lunch, and some expert tuition as well. He said the fishing days were designed for learners right up to experienced fishers. The Moree experience is one of two in Northern Tablelands to be funded under a program to help improve the recreational fishing experience for local fishers. “It is great to see $2.2 million will be invested in 42 new recreational fishing projects across NSW this financial year. This on top of $13.6 million worth of existing projects funded through the Recreational Fishing Trust,” Mr Marshall said. “These projects will help improve the recreational fishing experience for enthusiasts by stocking more fish, building fishing platforms and cleaning tables, providing recreational fishing education and protecting fish habitats. The recreational fishing sector in NSW generates around $3.4 billion to the State’s economy and accounts for more than 14,000 jobs across NSW.